What does God look like? This is a concept that may come up often for some youngsters. Children do not always grasp the concept of intangible things and sometimes struggle with thinking of God as a real present entity, since He is unseen. Children are great with imagining, but it’s important to impart that God is not imaginary, even though He is invisible. This Colossians 1:11-20 lesson takes a look at a passage that emphasizes Christ as a representation of God Himself. It also seeks to remind kids that we are to reflect God, and that He has rescued us for His kingdom. Lesson focus: God has made everything on the Earth, and He is above and beyond all of it. Jesus is our visible image of who God is, and He made it possible for us to be in God’s family. Lesson Opening: It’s there….it’s invisible. Start with an off-beat version of “Simon says…” In this exercise, students will be asked to stretch their imaginations as they follow directions. Invite them to stand and pantomime an activity. Depending on the setting and age, this could be something as simple as making a sandwich, or perhaps playing a game of indoor baseball or tennis. Make sure that it requires acting out something invisible or holding something invisible. To further warm up brains and imaginations, pair students up and have them play the “mirror game…” whatever one partner does, the other has to try and copy exactly, like a reflection of a mirror. Explain that today we will be talking about images and reflections. Paul reminds the people of where their salvation comes from, and of course it is also where our hope comes from. God has purchased our lives and our redemption. We are heirs of His kingdom. Talk with students about what inheritance means. God allows us to inherit Heaven because He adopts us as His children. What do we see there? What is the image of God? Obviously, we cannot see Him in person or experience the Father through our five senses. But what has been given to us as representation? The Son. Jesus Christ. That is how we see who God is. Everything that God is can be found in Jesus. There is a lot that Christ is, and it can be heavy for kids to comprehend. Jesus is God, fully and completely. And even though Jesus is all God, He was able to take all of our sin and punishment, in order to save us. Explain to kids that just like Jesus reflects God (or shows His image, like a mirror), we want to reflect Jesus. We cannot be perfect like He is, but when we act, we want to do things that point others back to Him. Our mirrors should point back to Jesus. Illustration: (If time allows) In Christ alone…take a small mirror and re-cap the image/reflection concept. Using duct tape, create a large cross in the mirror, and remind students of God’s image as Jesus. Then invite students to use shaving cream or dry erase markers to mar the mirror…remind them that sin keeps us from God and can mess up our lives. The good thing is that Jesus comes through that. Remove the tape to reveal that the cross is still there shining through. Our reflection can still be seen in HIS image! 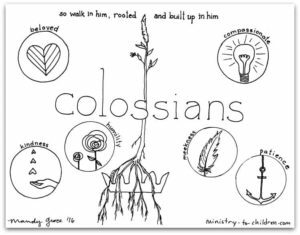 Craft: ID tag…invite students to remember that Jesus is God’s image, and we can be His image…provide card stock or paper “name badges” with a caption “my identity is in Christ alone! (name) reflects His image.” Allow students to decorate and attach to yarn. Close with prayer and thank God for all He has given. Ask for guidance as we seek to live out our faith and find our identity in Christ alone.